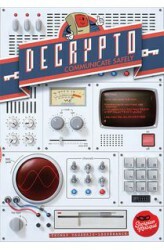 Players compete in two teams in Decrypto, with each trying to correctly interpret the coded messages presented to them by their teammates while cracking the codes they intercept from the opposing team. In more detail, each team has their own screen, and in this screen they tuck four cards in pockets numbered 1-4, letting everyone on the same team see the words on these cards while hiding the words from the opposing team. In the first round, each team does the following: One team member takes a code card that shows three of the digits 1-4 in some order, e.g., 4-2-1. They then give a coded message that their teammates must use to guess this code. 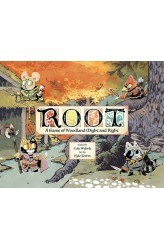 For example, if the team's four words are "pig", "candy", "tent", and "son", then I might say "Sam-striped-pink" and hope that my..
Root is a game of adventure and war in which 2 to 4 (1 to 6 with the 'Riverfolk' expansion) players battle for control of a vast wilderness. The nefarious Marquise de Cat has seized the great woodland, intent on harvesting its riches. Under her rule, the many creatures of the forest have banded together. This Alliance will seek to strengthen its resources and subvert the rule of Cats. In this effort, the Alliance may enlist the help of the wandering Vagabonds who are able to move through the more dangerous woodland paths. Though some may sympathize with the Alliance’s hopes and dreams, these wanderers are old enough to remember the great birds of prey who once controlled the woods. Meanwhile, at the edge of the region, the proud, squabbling Eyrie have found a new commander ..
A new faction is added to the forest fray. 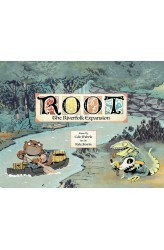 The Riverfolk expansion includes: A New Core Faction: The Riverfolk Company A New Core Faction: The Lizard Cult An Extra Vagabond Five Custom Card Holders Cooperative Scenarios Rules for Bot Play and Three Additional Vagabond Variants This expansion now allows Root to be played with 1-6 players. .. The dragon has been asleep for many long years. In that time, the cave under which it slumbered has changed greatly…Goblins and strange monsters have filled its gloomy depths and there are whispers that the cave itself has begun thinking, shifting, and growing evermore dangerous. Still, stories of peril rarely overshadow the rumors of riches. And riches there may be… For where a dragon slumbers, there also lies a fiercely guarded treasure. Fortunately for the slumbering beast, malevolent crystals fill the cave’s rooms with spectral light, hiding the entrance to the immeasurable treasure trove. Many have given their lives to the search and over the years the rumors have faded to legend. But the most courageous adventurers will not be discouraged by bloodshed. On this day, a knigh.. 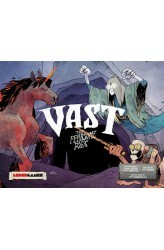 Contains all the miniatures for the game Vast: The Crystal Caverns except for the Ghoul, Ghost, and Unicorn, which are included in Vast: The Fearsome Foes. 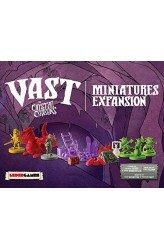 Empty slots are provided for these 3 miniatures in the insert of this expansion. 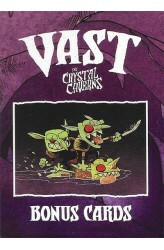 ..
Set of bonus cards for Vast: The Crystal Caverns, originally included as free extras for backers of the Kickstarter for the second printing and miniatures. This set includes the Silver Gauntlet and Treasure Trove promo cards from the first printing, plus a variety of other cards, including new Sidequests, Treasures, Events, Secrets, Schemes (a new type of Secrets card), and Upgrades for the Thief. Full Card List: Sidequests Noble Failure Prepared Treasures Silver Gauntlet (Original Promo, with revised text to include the Fearsome Foes characters.) Treasure Trove (Original Promo) Rune Staff Cursed Amulet Heroic Boots (Revised) Javelin (Revised) Events Quake .. 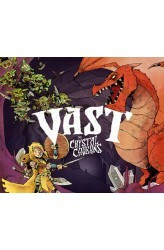 Introducing The Fearsome Foes, an expansion pack for Vast: The Crystal Caverns. This pack provides three new, interesting roles for all play styles, whether you want to deepen your solo experience or expand your game to play with up to seven players! Three new roles: GHOST: Reclaim the remnants of your mortal life using your spectral powers, manipulating your opponents with telekinesis or possessing them to do your bidding. GHOUL: Stalk and terrorize your opponents, growing stronger with each battle. Corrupted and evil, you live only to hunt. UNICORN: Gallop on magic winds and use your fearsome horn to punish your opponents. Regain your former radiance and escape this dark place forever. Each role comes with its own rulebook, detailed miniature, wooden meeple, se..